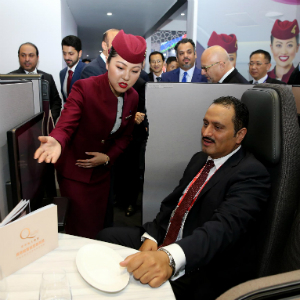 DOHA, Qatar, 2018-Nov-09 — /Travel PR News/ — Qatar Airways took centre stage at the China International Import Expo (CIIE), as it unveiled a host of its latest, state-of-the-art products and services. This included its award-winning Qsuite Business Class experience at an interactive stand, its unrivalled cargo offering and its services offered as part of Discover Qatar, the destination management specialist subsidiary of Qatar Airways, which plays a pivotal role in the growth of Qatar’s tourism industry. Organised by the Ministry of Commerce of the People’s Republic of China and the Shanghai Municipal People’s Government, with the World Trade Organization, United Nations Conference on Trade and Development and United Nations Industrial Development Organization as organising partners, the CIIE is the world’s first national-level expo to be set up with imports as the theme, aiming to open up new channels through which countries can strengthen trade cooperation and drive economic growth. This entry was posted in Airlines, Business, Festivals and Events, Travel, Travel Services, Travelers and tagged China, Expo, H.E. Sultan Bin Rashid Al Khater, H.E. Sultan bin Salmeen Al Mansouri, import, Mr. Akbar Al Baker, Qatar Airways, state-of-the-art. Bookmark the permalink.